Manchester United manager David Moyes salutes the fans as he leaves the pitch after his team's 4-1 win. MANCHESTER UNITED MANAGER David Moyes played down a fly-by protest against his stewardship after his side overcame Aston Villa 4-1 in the Premier League on Saturday. An aeroplane trailing a banner calling for Moyes’s dismissal flew over Old Trafford shortly after kick-off, but he received a warm reception from fans inside the ground and said that he felt he had their full support. 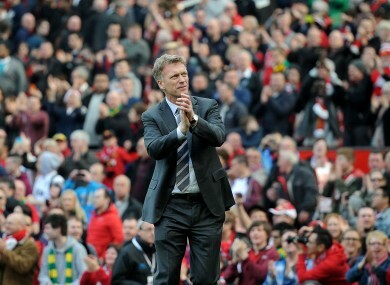 “I’ve been saying all the time since I’ve been here, the crowd have been great,” Moyes told BT Sport. Asked for his reaction to the round of applause he received as he walked down the touchline to the dug-out before the game, Moyes said: “I’ve always felt that that’s the way it is, I really do. The plane stunt, funded by a group of disgruntled United fans, is the biggest sign of open supporter dissent that Moyes has faced since succeeding Alex Ferguson last year. In the second minute of the game on a sunny afternoon in Manchester, a small white plane was seen to fly over the stadium towing a banner that read, ‘WRONG ONE – MOYES OUT’ in giant red letters. The protest was a response to a pro-Moyes banner, branding him ‘THE CHOSEN ONE’, that has been displayed by supporters in Old Trafford’s Stretford End since the beginning of the season. The plane’s appearance was greeted by boos and Wayne Rooney, who scored two of United’s goals, said that the players had been unmoved by the protest. “To be honest, we didn’t make anything of it,” he said. “We know the support the manager’s got from the players, the support which he’s been getting from the fans the last few games, and that’s what matters. “It doesn’t matter what’s written in the newspapers or what certain people are saying, it’s what matters to us as a team. United’s afternoon got off to a bad start when Ashley Westwood’s free-kick gave Villa a 13th-minute lead, but Rooney scored twice before half-time and further goals from Juan Mata and Javier Hernandez completed the comeback. Moyes, 50, has endured a torrid debut campaign at United, who have fallen well off the pace in the Premier League and crashed out of both domestic cup competitions. They went into the weekend 12 points below the Champions League places, ahead of the first leg of their quarter-final against holders Bayern Munich in this season’s competition on Tuesday. Email “Moyes plays down plane protest following Villa victory”. Feedback on “Moyes plays down plane protest following Villa victory”.